Is your optical refractometer or hydrometer causing you to feel uncertain about your salinity measurements? 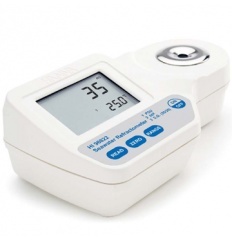 The HI96822 Digital Refractometer eliminates this worry by digitally measuring your water's refractive index to determine the salinity of natural and artificial seawater – including brackish, ocean water or saltwater aquarium. Designed for seawater salinity analysis, not NaCl. Automatic temperature compensation from 0-80°C (32-176°F). High accuracy measurements displayed as PSU, ppt, and specific gravity. Built with a aerodynamic body, the Razor X LED Lighting System is designed to seamlessly merge into your living area with elegance and style. The Razor X is an all-in-one LED system utilizing the latest in LED technology, including Cree XT-E and XP-E high intensity LED chips distributed in 4 different channels, offering impressive performance and versatility. Built-in ControllerThere’s no need to buy an additional controller just to be able to use your aquarium lighting, the Maxspect Razor X has control built-in. The built-in controller integrated in the Razor X features an OLED monitor and a control dial, from which user can easily set up all the functions for the fixture. 2 or more Razor X fixtures can be connected together through the Master/Slave mode to control them simultaneously - all Slave fixtures will follow the settings programmed on the Master fixture, saving time and effort on setting up multiple fixtures. 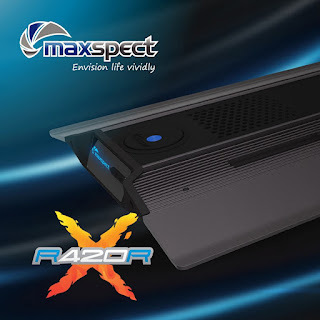 The Razor X can be wirelessly connected to a Maxspect Connect ICV6 controller (sold separately), which allows the Razor X fixture(s) to be controlled by iOS or Android devices through the Syna-G app. The Razor X Lighting system utilizes the 410/420nm Super Actinic LED chips, the spectrum that's crucial for the success of any reef and water plant aquariums as it is required by Chlorophyll A for photosynthesis, where absorption peaks at 412nm. The Razor X Lighting system deploys an ingenious aerodynamic design which draws cool air from underneath the fixture, through its body which also serves as a large heat sink, to dissipate heat passively. Equipped with fans to regulate fixture temperatures in enclosed environments. The fan(s) will be automatically engaged when the temperature is above 55°C/131°F, and disengage when it is below 45°C/113° F.